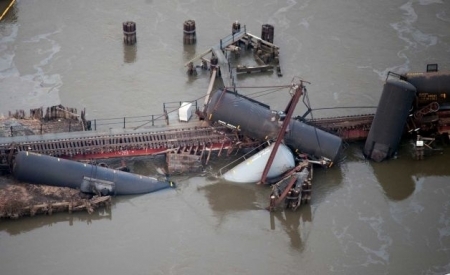 A freight train derailment on a bridge over the Mantua Creek in Paulsboro, NJ at around 7 a.m. Friday morning has caused a chemical leak that sent dozens to area hospitals. The Conrail train had 2 locomotives and 84 cars. Seven cars derailed, 2 on land, 5 on the bridge with 4 ending up in the water. One of those cars was punctured and leaked it's contents of Vinyl chloride into the air and water. When Vinyl chloride is in the air as a gas it can cause dizziness, drowsiness and headaches as well as respiratory and eye irritation. The chemical is used in the making of plastics. Initially the immediate area was evacuated and 71 people were treated at Underwood Memorial Hospital in Woodbury. Crews will be monitoring the levels of the chemical, but authorities have issued a new evacuation order effective at 7 p.m. About 500 people in a 12 block radius were told to pack enough clothes for 3 days were transported to local hotels. This isn't the first time this bridge has had trouble. A derailment occurred there in 2009, just not as disastrous. The National Transportation Safety Board has taken over the investigation and cleanup. A crane is on it's way from New York. It will take a few days to remove the damaged cars from the water being careful not to leak any more Vinyl chloride into the air. A public assistance center has been set up at the Paulsboro Fire Department in the 1500 block of Swedesboro Avenue. The Pennsylvania Board of Probation and Parole have fired three employees in the wake of and investigation following last summer's murder of off duty Officer Moses Walker Jr. The alleged killer, Rafael Jones, had been released from prison only 10 days prior to the murder. Police say he shot and killed Walker in a botched robbery attempt. Jones was released on “special probation” and never fit with an electronic monitoring device. The employees “terminated due to violations of board procedures, the board’s code of conduct, and shortcomings in the manner in which Jones was supervised,” said Spokeswoman Sherry Tate. They are making changes to the system as a result of the investigation and are also looking at changing to GPS devices from electronic monitoring devices. Police are looking for a armed suspect who robbed a pizza shop in Philadelphia's Feltonville neighborhood. The unknown male entered Pizza Point at 400 East Wyoming Ave. He approached the four employees with a shotgun and demanded money. He forced them into a basement office. The suspect made off with $400. He is described as a 5-foot-11, black male with a thin build around 20-25 years old. He was wearing a black hooded sweatshirt, dark colored hooded Adidas jacket with striped sleeves and a red baseball cap. Police are asking anyone with information to call 911 or 215-686-TIPS (8477).